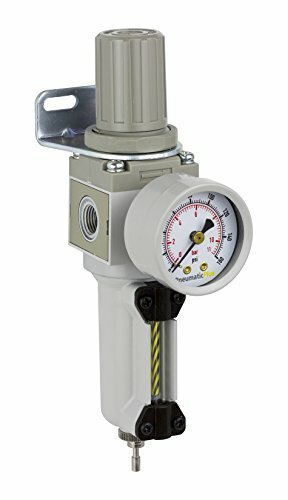 Pneumatic Plus SAW Series Filter-Regulators, or "Piggybacks" combine the functions of both filter and regulator. Piggybacks are compact and most effective when space is constrained. FILTER: Filtering out of dirt and foreign particles, and the separation of moisture is automatic with air flow. There are no moving parts and no adjustments are necessary. Accumulated sludge and moisture should be drained off. Sediment should not be permitted to fill above the lower baffle. Wash filter element at intervals with methylene chloride or similar cleansing fluid to maintain filtering efficiency. To clean element, depressurize system, pull down the lock and twist off the metal guard and polycarbonate bowl and unscrew element from head. Dry filter element thoroughly before reassembling. Clean filter bowl(s) only with soapy water. Inspect O-ring, replacing if damaged or distorted. Reassemble with care to avoid stripping threads on bowl. After a metal bowl with sight is tightened, it may be rotated up to 180° (for proper viewing.) REGULATOR: Before supplying the air, turn the adjusting knob counter-clockwise until compression is released from the control spring. Turn on the air supply and adjust the knob to set the desired secondary pressure by turning the knob clockwise. Note: Adjustment knob must be pulled away from the body of the regulator to operate. After desired secondary pressure is set, pushing the knob back towards the body will lock the control knob. IMPORTANT: Use care to avoid screwing fittings too far into body of units as it may close internal ports. Normally finger tight plus one turn will seal. Bowl (Metal or Polycarbonate) and Drain (Auto or Manual) Options available.